Bridging Online and Offline Social Networks. To which extent are SNSs used to maintain existing social relationships? Leading research into social networking sites considers such issues as presenting and managing oneself online, the different 'classes' of users in MySpace and Facebook and the distinction between real-life friends and 'friended' friends. Another set of work, often non-academic, concerns how to make use of the copious amounts of personal data placed online. We wish to dub this work 'post-demographics.' Post-demographics could be thought of as the study of the personal data in social networking platforms, and, in particular, how profiling is, or may be, performed, with which findings as well as consequences. With the 'post' prefix to demographics, the idea is to stand in contrast to how the study of demographics organizes groups, markets and voters in society. The term post-demographics also invites new methods for the study of social networks, where of interest are not the traditional demographics of race, ethnicity, age, income, educational level or derivations thereof such as class, but rather tastes and other infomation supplied to make and maintain an online profile. Which methods may be brought to bear in order to conceptualize significant derivations of profile information, apart from markets niches? Post-demographics is preferred over post-demography (a more formal term), as it recognizes popular usage of the notion of a demographic referring to a segment or niche that may be targetted. Crucially the notion attempts to capture the difference between how 'demographers' and, say, 'profilers' collect as well as use data. Demographers would normally analyze official records (births, deaths, marriages) and survey populations, with census-taking being the most well-known of such undertakings. Profilers, contrariwise, capture information from users of online platforms. Perhaps another means of distinguishing between the two types of thought and practice is with reference to the idea of "digital natives," those growing up with online environments, and unaware of life prior to the Internet, especially with the use of the series of manual systems that came before it, like a library card catalogue (Prensky, 2001). The category of digital natives, however, takes a 'generational' view, and in that sense is a traditional demographic way of thinking. The post-demographic project would be less interested in new digital divides (digital natives versus non-natives) and the narratives that emerge around them (e.g., moral panics), but rather in how profilers place, fit or match populations of users owing to common tastes. "We define social networking websites here as sites where users can create a profile and connect that profile to other profiles for the purposes of making an explicit personal network." Thus begins the study of American teenage use of such sites as MySpace and Facebook (Lenhart and Madden, 2007). 91% of the respondents use the sites to 'manage friendships'; less than a quarter use the sites to 'flirt'. Leaving behind surveys of user experiences for a moment, what is not as well known is what "non-users" do with social network sites. Non-users are those who do not manage friendships or flirt, but still visit the sites and read the profiles. They are also interested in the data sets. The proposal here is to study and make a contribution to the non-users -- those researchers that both collect as well as harvest (or scrape) social networking sites' data for further analysis. How could one characterize the difference between the databases of online platforms and the databases of old (and new) that profile users to 'sort' and target (Grandy, 1993). Database philosophers were once deeply concerned about how field character limits -- the number of letters that would fit on each line in the (electronic) form -- would impoverish the self, just like bureaucracy turned people into numbers (Poster, 1991). People could not describe themselves fittingly in such short, mandatory fields. Now, with online platforms, there are longer character limits, suggested fields, and free text spaces, with prospects for a more expansive self. The database has more memory. "Other," that last heading available on the form, standing for difference, has become "add your own field," helpfully offering further self-definition. Now that the database is reaching out, providing you with more space to be yourself, what does your form-filling say about you? Do you fill in the defaults only? From a post-demographics perspective, the profile lies at the core of research into social networking sites, as it provides information that moves beyond the demographic, organized according to 'interests' and 'favorites', with more specific sub-categories as brands, music, movies, animals, etc. The rise of online social networking fits into what could be referred to as the social shift of the Web. This is a change from the Web as a network of interlinked texts to a more social Web, in which the users are the nodes in networks, actively organizing themselves around social objects (Knorr-Cetina, 2001; Engeström, 2005). On social networking sites, the users are invited to fill in personal information, 'friend' (the new verb), share objects and join groups. The fields for age, gender and location are still present; yet profiles and personal pages prominently display the post-demographic and media files as movies, music and pictures. Scholars from across disciplines have developed approaches to studying social networking sites (using the acronym, SNSs), varying from surveys about profile behaviour (Donath and Boyd, 2004) to analyses of friending versus making real-life friends (Fono and Raynes-Goldie, 2006). As is the norm for the digital methods undertaking, here the emphasis is on the opportunities for research made available by the data as well as the capabilities and constraints involved in harvesting it. Which social networking sites are scrapable, and to which extent? Given that the users are providing data with fields devoted to interests as opposed to basic demographics, and given that these interests can be mined and analysed to create new groupings, which attributes do these groups have? In particular, we are interesting in the new privileging mechanisms created by post-demographic data. Whilst governments and marketing may find particular relationships between age, income and location of interest (for different reasons), which actions are being undertaken by profilers, given a particular blend of interests? Instead of user-participation, observation, surveying as well as other approaches imported from the social sciences, the methods here depart from a non-user perspective, and strive to think through what the profilers would do, and build upon it. Thus, first it is important to identify the constraints per social networking platform in harvesting data. Once data may be harvested, the further step is to identify the set of relationships that could be studied, e.g., do friends have the same interests? When, and for which purposes, are interests a more significant mode of organizing, sorting and recommending action than demographics? 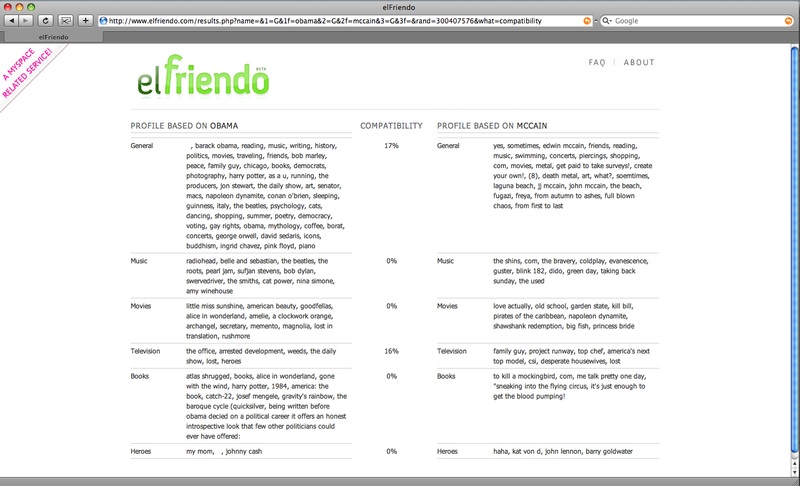 Elfriendo.com is the outcome of thinking through how to make use of the profiles on the social networking platform, MySpace. Enter a single interest, and the tool creates an entirely fresh profile on the basis of the profiles of people with that single interest. One may also compare the compatibility of interests, i.e., whether people with one interest are compatible with the people with the other interest. One may perform analysis, if that is the right word, with the tool. For example, one compares the profiles of people with Barack Obama as an interest with the profiles of people with John McCain as an interest. Obama-related media tastes differ from McCain -related media tastes. Donath, Judith and Boyd, Danah (2004). "Public displays of connection." BT Technology Journal, 22(4): 71-82. Fono, David and Raynes-Goldie, Kate (2006). "Hyperfriendship and Beyond: Friends and Social Norms on LiveJournal." In: Consalvo, M. and Haythornthwaite, C. (eds. ), AoIR Internet Research Annual Volume 4. New York: Peter Lang. Gandy, Oscar (1993). T he Panoptic Sort: A Political Economy of Personal Information. Boulder, CO: Westview Press. Knorr Cetina, Karin (2001). "Objectual Practice." In: Schatzki, Theodor R., Knorr Cetina, Karin and von Savigny, Eike (eds. ), The Practice Turn in Contemporary Theory. London: Routledge, 175-188. Lenhart, Amanda and Madden, Mary (2007). "Social Networking Websites and Teens." Pew Internet Project Data Memo. Washington, DC: Pew Internet & American Life Project, http://www.pewinternet.org/pdfs/PIP_SNS_Data_Memo_Jan_2007.pdf. Poster, Mark (1991). The Mode of Information. Chicago: University of Chicago Press. Prensky, Marc (2001). "Digital Natives, Digital Immigrants." On the Horizon. 9(5), http://pre2005.flexiblelearning.net.au/projects/resources/Digital_Natives_Digital_Immigrants.pdf. In research into social networking sites, how are the data collected, what type of analyses are performed, which questions are asked and what are some of the key findings? Two important means of gathering data are taking surveys (a method imported from social science) and scraping data directly from a site (a profiler's approach). The following overview is based on Boyd and Ellison (2007). SNSs refer to Social Networking Sites. Donath and Boyd (2004), "public displays of connection" serve as important identity signals that help people navigate the networked social world, in that an extended network may serve to validate identity information presented in profiles. Marwick (2005), found that users on three different SNSs had complex strategies for negotiating the rigidity of a prescribed "authentic" profile. Skog (2005), found that the status feature on LunarStorm strongly influenced how people behaved and what they choose to reveal. Profiles there indicate one's status as measured by activity (e.g., sending messages) and indicators of authenticity (e.g., using a "real" photo instead of a drawing). Zinman and Donath (2007), noted that MySpace spammers leverage people's willingness to connect to interesting people to find targets for their spam. Walther, Van Der Heide, Kim, & Westerman (in press), the extent to which the attractiveness of one's Friends (as indicated by Facebook's "Wall" feature) impacts impression formation. Golder, Wilkinson, and Huberman (2007), recognizing patterns in friending and messaging activities. Dataset: An anonymized dataset consisting of 362 million messages exchanged by over four million Facebook users for insight into Friending and messaging activities. Lampe, Ellison, and Steinfield (2007), Relationship between profile elements and number of Facebook friends, finding that profile fields that reduce transaction costs and are harder to falsify are most likely to be associated with larger number of friendship links. Adamic, Büyükkökten, & Adar (2003), Heer & Boyd (2005), Paolillo & Wright (2005): Using online data for network visualizations. Kumar, Novak, and Tomkins (2006), Analyzed the roles people played in the growth of Flickr and Yahoo! 360's networks, and argued that there are passive members, inviters, and linkers "who fully participate in the social evolution of the network"
Herring et al. (2007), an analysis of the role of language in the topology of Friendship. Spertus, Sahami, and Büyükkökten (2005), topology of users through their membership in certain communities, based on Orkut data. They suggest that sites can use this to recommend additional communities of interest to users. Liu, Maes, and Davenport (2006) argued that Friend connections are not the only network structure worth investigating. They examined the ways in which the performance of tastes (favorite music, books, film, etc.) constitutes an alternate network structure, which they call a "taste fabric." Ellison, Steinfield, and Lampe (2007) suggest that Facebook is used to maintain existing offline relationships or solidify offline connections, as opposed to meeting new people. These relationships may be weak ties, but typically there is some common offline element among individuals who friend one another, such as a shared class at school. Ellison et al. (2007), compared dimensions of SNSs and earlier forms of public CMC such as newsgroups. Lampe, Ellison, and Steinfield (2006), how online interactions interface with offline ones. Facebook users engage in "searching" for people with whom they have an offline connection more than they "browse" for complete strangers to meet. Lenhart & Madden (2007). Pew research found that 91% of U.S. teens who use SNSs do so to connect with friends. Choi (2006), extent to which SNSs are embedded in user's lives. In Korea, Cyworld has become an integral part of everyday life. 85% Of that study's respondents "listed the maintenance and reinforcement of pre-existing social networks as their main motive for Cyworld use" (Choi, p. 181). Survey. Boyd (2008) argues that MySpace and Facebook enable U.S. youth to socialize with their friends even when they are unable to gather in unmediated situations. SNSs as public spaces. Participatory Observation. George, 2006; Kornblum & Marklein, (2006), press coverage of privacy concerns related to younger SNS users. Analyzing press coverage. Gross and Acquisti (2005) analyzed 4,000 Carnegie Mellon University Facebook profiles and outlined the potential threats to privacy contained in the personal information included on the site by students, such as the potential ability to reconstruct users' social security numbers using information often found in profiles, such as hometown and date of birth. Analyzing online data. Acquisti and Gross (2006) argue that there is often a disconnect between students' desire to protect privacy and their behaviors. Survey? Dwyer, Hiltz, and Passerini (2007), trust on SNSs. Trust and usage goals may affect what people are willing to share. Facebook users expressed greater trust in Facebook than MySpace users did in MySpace and thus were more willing to share information on the site Agen Judi Online Survey. Jagatic, Johnson, Jakobsson, and Menczer (2007), security issues and SNSs. Used freely accessible profile data from SNSs to craft a "phishing" scheme that appeared to originate from a friend on the network; their targets were much more likely to give away information to this "friend" than to a perceived stranger. Anayzing online data. Lenhart & Madden, (2007) Pew found that 55% of online teens have profiles, 66% of whom report that their profile is not visible to all Internet users Of the teens with completely open profiles, 46% reported including at least some false information. Survey. Preibusch, Hoser, Gürses, and Berendt (2007) argued that the privacy options offered by SNSs do not provide users with the flexibility they need to handle conflicts with Friends who have different conceptions of privacy; they suggest a framework for privacy in SNSs that they believe would help resolve these conflicts. Researching privacy statements. Hodge (2006) Agen Sbobet Terpercaya argued that the fourth amendment to the U.S. Constitution and legal decisions concerning privacy are not equipped to address social network sites. For example, do police officers have the right to access content posted to Facebook without a warrant? The legality of this hinges on users' expectation of privacy and whether or not Facebook profiles are considered public or private. Researching legislation. Fragoso (2006) examined the role of national identity in SNS use through an investigation into the "Brazilian invasion" of Orkut and the resulting culture clash between Brazilians and Americans on the site. Hjorth and Yuji (in press) compare Japanese usage of Mixi and Korean usage of Cyworld. Other scholars are beginning to do cross-cultural comparisons of SNS use. Herring et al. (2007) examine the practices of users who bridge different languages on LiveJournal. Hewitt & Forte (2006), how students feel about having professors on Facebook. Survey. Mazer, Murphy, & Simonds, (2007), how faculty participation affects student-professor relations. Survey. Perkel (in press), analyzed copy/paste practices on MySpace as a form of literacy involving social and technical skills. Project by Marc Andrews, Joris Bootsman, Erik Borra (Media analyst), Paulien Dresscher (Media analyst), Declan Rek (Technical developer), Maarten van Sprang (Media analyst), Matthijs Volkers (Technical developer). 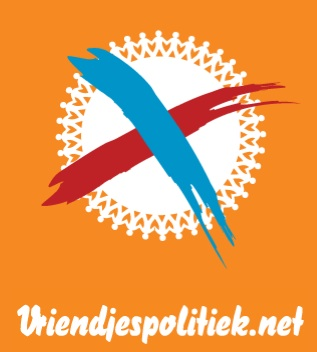 An example of the use of post-demographics is a project called "vriendjespolitiek," which may be translated as cronyism, but here actually means "friends' politics." The project achieves what one may call a mode-switch in focus from what the characteristics of individuals can tell us about the individuals, to what the characteristics of their friends/connections can tell us about them. Friends' Politics is built on top of Hyves, the popular social networking site in the Netherlands.